Irvington, NY takes small town charms and blends it with a modern pace of life. In other towns, you might enjoy a fun night eating at your favorite restaurant and seeing a movie. In Irvington, that feeling is multiplied with stunning views of the Hudson River and with services that go beyond the normal measure. Though the town may be small, its amenities aren’t. 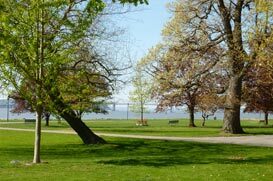 If you want to feel pampered, not just by city luxuries, but by home luxuries, start your home search in Irvington, NY. Via the Hudson Line, residents can take the commuter train to New York City’s Grand Central Terminal. Trains leave every 25-35 minutes on weekdays. Irvington is located along Highway 9 and I-87, giving you quick access to neighboring towns and communities. From the Cross Westchester Expressway, you can hop over to I-95 and ride to other popular areas like Stamford and New Haven. Irvington got its name when local residents voted to change the name in honor Washington Irving, author of The Legend of Sleepy Hollow. Later on, affluent New Yorkers began purchasing land here to build lavish estates. Today, Irvington’s real estate reflects the extravagant details left behind by their predecessors and the atmosphere they came for: A relaxing, summertime retreat. Now, many residents get to enjoy the same feeling. Below, you can find a short list of great schools in and around Irvington. If you’d like to learn more about the schools in Irvington, you can contact us for more input. As mentioned before, Irvington real estate spares no expense on amenities. From the village’s history to present day, the one thing residents have focused on is comfort. Homes provide everything you need, from luxurious master suites to extraordinary views of the Hudson River. Whatever you’re looking for in a house, it’s guaranteed that Irvington has already fulfilled the request. For more information about Irvington, please don’t hesitate to contact us.